1974 DII National Champion @ 150lbs. ▪ NCAA Finals - 150lbs. Bill Luckenbaugh (ESSC) pinned Roger Warner (Cal Poly) 3:35. (Back Row) ESSC Head Wrestling Coach - Clyde H. "Red" Witman. Lucky Gets Crown And Trophy! at 150 pounds, pinned Roger Warner of Cal Poly San Louis Obispo in 3:35 of the final round match. This was his fourth pin in five tournament matches and it enabled him to win a trophy for the most pins. Lucky also was second to Bloomsburg's 177lb. Floyd Hitchcock in the outstanding wrestler balloting. Bob Stetler, another "Warrior Wonder," took 3rd in the 158 pound class winning four consolation matches. to Kuehl for a second time, just missing out on All-American status in the 1974 NCAA DII tourney. the trio managed to score high enough for "seventh place" out of forty colleges. won the heavyweight college division (DII) title in 1970. Outstanding Wrestler Award to Bloomsburg's Floyd "Shorty" Hitchcock. Coach Clyde Witman is president of the NCAA DII Coaches Association. was the "2nd seed" at the 1974 NCAA Division I Wrestling Championships in Iowa City. prior week hindered his progress in what would have been, a sure All-American medal. for the NCAA Division I tournament in Iowa City. & his California trek to the NCAA DII Wrestling Championship @ 150lbs.!" ▪ West York Wrestling 73' to 77' ESU Alumni Results Page! Bill Luckenbaugh -150lbs. (East Stroudsburg State). Robert Stetler -158lbs. (East Stroudsburg State). ▪1974 PSAC Most Outstanding Wrestler - Wade Schalles, Clarion State. Dave Whare MI, Willis Divel SH. Keith Kosky IUP, Jim Bailey MA. Gary Walk LH, Geno Zuccaro CAL. George Way LH, Jim Sykes IUP. Tom Hutchinson IUP, Ralph Reish WC. Chris Clark CL, Steve Maxwell WC. Joe Jacquelin MI, Ron Peifer SR, Ralph Pivirotto ED. Ray Watkins ED, Al Fricke LH, Eric Swanson WC. Tom Schweinburg IUP, John Hohman BL, Chris Cole CL. Bob Eshleman WC, George Schenck K.
pinned Bloomsburg's Floyd "Shorty" Hitchcock in the PSAC 177lb. finals. 12th -Mansfield (MA), 13th - Kutztown State (K). ▪ ESSC Head Coach - Clyde "Red" Witman & Asst. Coach - Bob Dalling. 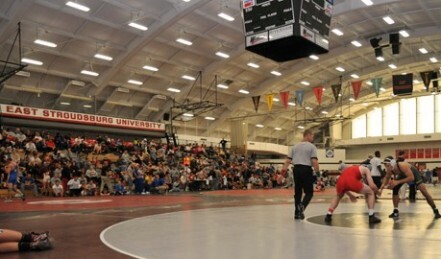 Wrestling Conference championships held Saturday on the Slippery Rock State wrestling mats. of Rich Schumacher of Indiana, Pa. Bob Stetler of ESSC also won the PSAC 158lb title. and Bloomsburg State, 80. Lock Haven was fifth in the 13-team field with 60 1/2 points. Bill Shuffstall of Slippery Rock, 6-1, in the championship 190lb. semi-final round. Shuffstall won the PSAC championship at 190lbs defeating Jim Zoschg (MI), 7-1.
with a (2-2) mark. Both did not place in the tournament. at the Cal-State University Fullerton Gym, Orange County, California.